It feels so wild down there, where the Blaeberry river runs through the ranch. In the winter when the whole landscape is covered in snow there’s hardly a sign of man except for a few ski and snowshoe tracks. It’s a silent corridor for all the animals. Right now it’s filled with spawning Kokanee Salmon. The Eagles and bears are here too. Soon the wolves will be back following the elk herds and I’ll hear them howling every every few nights. 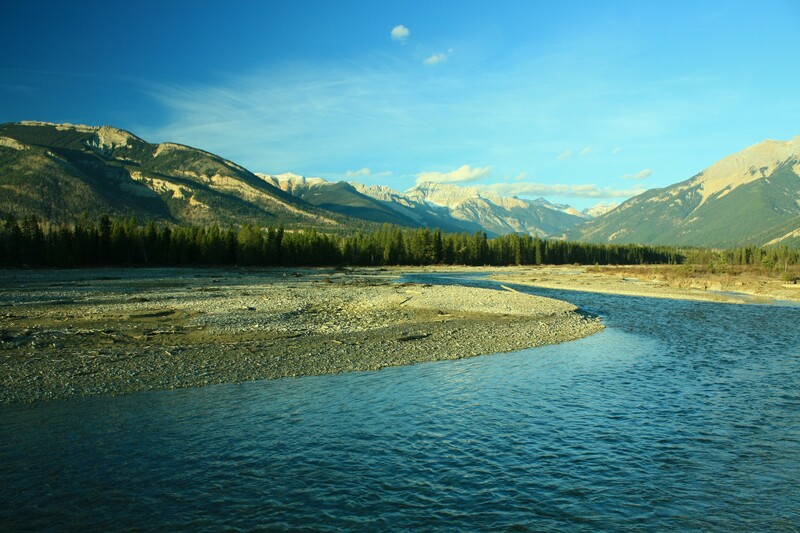 Over two hundred years ago, with a few very tough men, a Scottish explorer named David Thompson crossed from the North Saskatchewan River over the Canadian Rockies and into a breathtaking wide valley. Above, behind and around them, massive glaciers bled waterfalls into a turquoise river. They hollowed out Cedar trees for canoes. They called it the, ‘Blaeberry’ That’s the Scottish way of saying blueberry, but, they’re really huckleberries! My neighbors and the Grizzlies pick them every fall. There’s a story of a young girl that fell asleep after she filled her self and her bucket with them. When she woke up her bucket was empty. David Thompson respected the Native people. He learned their ways and four of their languages. He married a Cree Metis woman. His associates tried to force him to bring alcohol over the pass to sell to the Native people, he had seen the harm it did and refused. A few miles downstream from my ranch the Blaeberry River meets the Columbia. He found this a year before Lewis and Clarke in 1807, but it runs north here and he didn’t realize it was the Columbia until the next year when he reached the Pacific. Letters back and forth reveal how deeply he and his wife loved each other. They would follow the Blaeberry on horseback up over the Rockies to the prairies. One time at the top they found their baby had fallen from the back of the horse where he had been sleeping. They galloped back down the pass and found him asleep in his papoose on the snow. Thompson’s friendship with a Blackfoot Chief probably helped save his life when the tribes began to see the true color of many of our kind. They almost starved to death several times, life was incredibly hard. They never gave up. His wife gave him thirteen children and stood by him his whole life. Sometimes you have to give up or start over. With the support of friends I’ve decided it’s time to change the name I gave this ranch fifteen years ago to the name of a virtually undiscovered treasure. Today it is called ‘Blaeberry Valley Buffalo Ranch’. I hope you’ll come and discover it someday too. Traveller’s from all over the world come here to get married on the land, to learn about the buffalo and life with them, to stay in the cottage and to discover their own stories. The buffalo are a bridge to all the wild creatures that live here and to the people and my life with them. I hope this valley and my ranch continue to be a reflection of all that is good here. Through my writing, my music, and the buffalo, I want to give something different than what you usually get when you buy a CD, or read something, or make a journey. I want my art, what I have learned and my life to become a prayer, to God, for the Earth, for the creatures, for each other and I hope for Canada and Blaeberry Valley Buffalo Ranch. I’ve seen this land and the buffalo help me and others find the love in their own story. I hope we will help you find yours.